MOSCOW, February 1. /TASS/. Self-defence forces of the self-proclaimed Donetsk People’s Republic (DPR) on Sunday nipped an attempted breakthrough of two convoys with munitions for the Ukrainian troops trapped in Debaltsevo but let vehicles with would leave the area, a spokesman for the DPR defence ministry said. "Early in the morning on February 1, the self-defence forces nipped attempted breakthrough of two convoys with munitions, fuels and foods for the Ukrainian troops trapped in Debaltsevo," said Eduard Basurin. "Three convoys with medical and cargo vehicles with wounded Ukrainian soldiers were allowed to leave Debaltsevo," he stressed. "Our units blocking the Debaltsevo-Artemovsk highway were not shelled. Although, according to reconnaissance data, one of these convoys evacuated commanders of the Ukrainian army’s Debaltsevo unit." "Over the past night and in the first half of the day on Sunday, the Ukrainian troops were regrouping forces to prepare a breakthrough from the Debaltsevo ring," Basurin said. 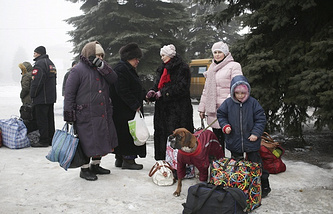 "Armoured vehicles and personnel are beings witched from Debaltsevo to Popasny. According to reconnaissance data, the Ukrainian command plans another breakthrough attempt here." He said that the DPR forces were reinforcing the ring arounf Debaltsevo. 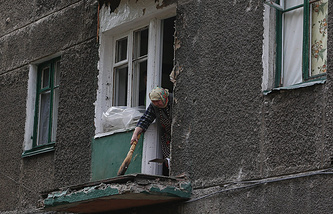 Ukrainian troops often come under ragged friendly fire, Eduard Basurin said. 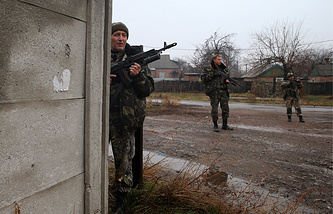 "On Sunday morning in Uglegorsk, three Ukrainian serviocemen blocked in a private house in the town;s eastern suburb agreed to surrender arms yield themselves to the DPR forces. 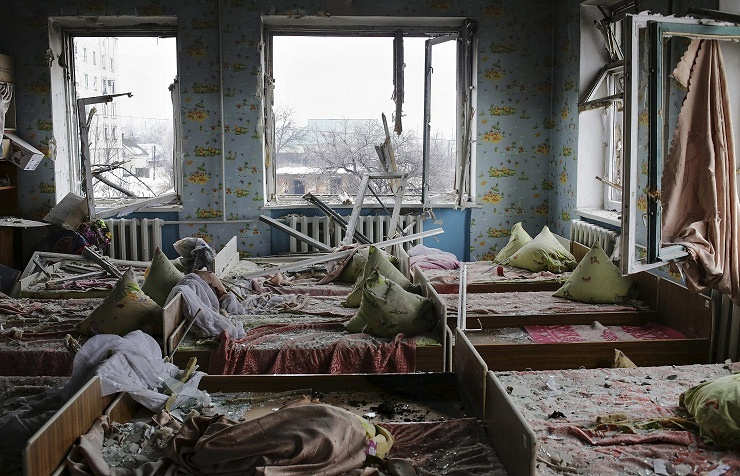 But a Ukrainian Grad missile hit the house killing them all. Our servicemen were wounded," he said. "This was not a sporadic case. A big number of Ukrainian troops are being killed as the Ukrainian artillery shells settlements Ukrainian servicemen are leaving," he said. Ukraine’s army lost 57 troops, five tanks, seven armoured infantry carriers and 12 artillery systems in the past 24 hours, a spokesman for the defence ministry of the self-proclaimed Donetsk People’s Republic said. "Over the past 24 hours of combat operations, the Ukrainian army lost 57 troops, five tanks, seven combat infantry vehicles and 12 artillery units and mortars," he said. "Two field depots with munitions for Grad multiple launch rocket systems and conventional artillery were seized." In the past 16 days, according to Basurin, Ukraine’s army lost 136 tanks, 110 combat infantry vehicles and armoured vehicles, 80 artillery units and mortars, and 58 cars. "Personnel losses stood at 1,569 people," he said. H e also said that DPR security agencies were exposing and neutralizing small groups of Ukrainian soldiers in the settlements of Chernukhino and Uglegorks taken under DPR control on Saturday. "Nine Ukrainian servicemen were detained. Four of them have serious wounds. These people have been left here by their commanders while retreating to Debaltsevo," Basurin said, adding that the wounded had been offered medical assistance.